It’s a slow week but I plan to add at least one book review and one final stock watchlist before the long 4th of July weekend. 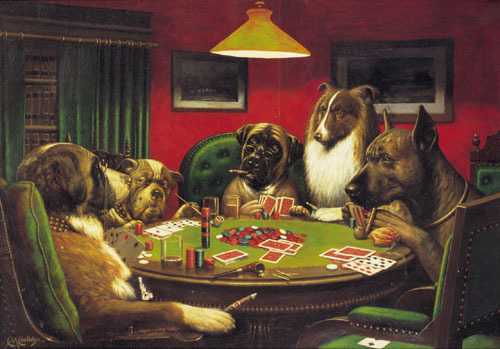 But for today, in tribute of an upcoming game I have in the city – my dog Bob is playing poker! 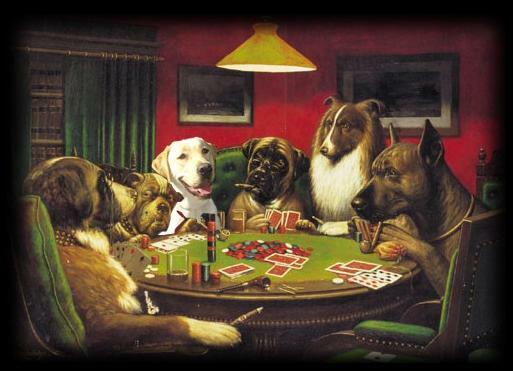 Take a close look and you will see that I added my dog into the poker picture below! 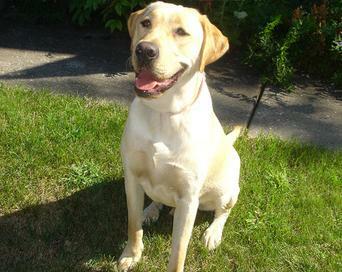 Now, that’s what I call a good looking lab! The arrival of the Thanksgiving holiday brings the one year anniversary of an article I wrote that was published in the magazine: The Trader’s Journal. 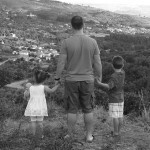 The article explains the basis of position sizing and expectancy and how poker has made me a better trader. 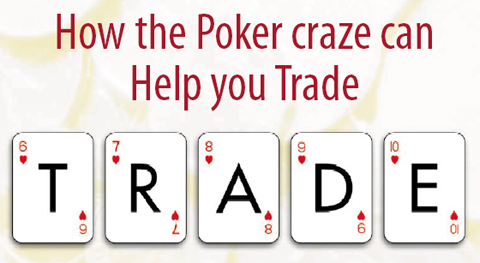 By playing poker, I have cemented my understanding of how people act, how to play the right odds, how to develop expectancies based on the cards I am dealt and how to position my trades properly. Watching these techniques and rules work within a short period of time really drove home the importance of a system that follows the proven rules. Trading can be a long, tedious and impatient road to travel but following the rules and employing proper position sizing and expectancy calculations will almost guarantee success if the rest of you system does it’s job. If your system is broke, find one that works and understand that you won’t go broke by properly placing your trades or bets and understanding how much you can and will win from each trade and/or bet. Many investors fail in this world due to their fear of losing money. Brilliant people continue to fail at trading the markets because of their emotions, not their intelligence or their work ethic. It’s their psychological make-up and their pre-programmed society based beliefs as partially explained in The Holy Grail of Trading: It’s not your System. I don’t want to confuse the concept of conserving one’s wealth by employing proper money management techniques and the actual fear of going broke. Fearful investors base their entire system, thoughts and style of investing on a negative thought process or a negative mental attitude. Successful investors, whether it is stocks, real estate or businesses, always develop strategies to protect from the down-side by focusing on the reward versus the original risk. Successful investors develop systems with expectancies that allow them to negate emotional fear by knowing what can happen if the investment fails. Successful investors are emotionally prepared to handle the side effects of losing money. Unsuccessful investors think about losing the initial investment and more often than not, pass up on a potential golden opportunity. How many times have you heard a person say: ‘if I only put my money into that stock or that piece of real estate”? These same people are also the ones that continue to pass up on potential opportunities today because they are scared to lose. Nothing comes easy and life rarely serves up a free pass without some form of risk attached. When speaking in terms of stocks, an investor must place money after their best ideas or they will never know if they have a winning system. Many people paper trade and claim they can pick winners but I view them as fearful of losing money. The fear of money and the fear of losing are two of the main reasons why so many people go broke on Wall Street. If you don’t fear money and can accept losing as part of the game, you will eventually become successful. 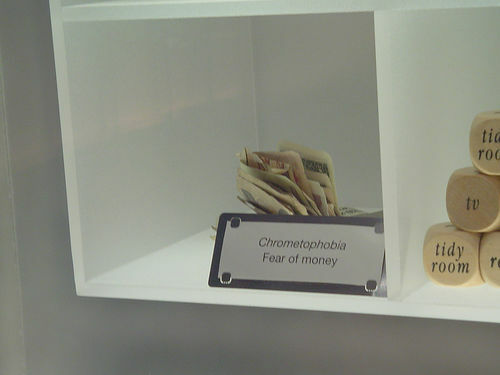 A scared poker player can serve as a perfect example of the type of person that fears to lose money. Take the time to sit at any $1-$2 no-limit hold’em game at a casino and you will quickly realize who fears money and who plays without fear. Good players may continually lose because they fear the dollar and fail to play according to their strategy. I have seen several bad players win lots of money at the tables because they bully the scared players out of their hands. They essentially make suckers out of the better player so in the end; the better player goes home broke and emotionally damaged. For example: let’s say you are dealt a KK and raise on the first bet but one of these fearless “garbage bully players” re-raises all-in to scare you out of the pot. I have heard many stories of players folding high quality hands due to their fear of getting a bad beat. In this case, the bully can only represent one hand that can beat yours, so the odds are heavily in your favor so you must call and call quickly (don’t have fear when the odds say you should win). Two remedies exist for the fear of a bad loss: a bankroll that can withstand a few bad beats and a strategy that capitalizes on hands with high odds for potential winners. Over the long term, you will be a consistent winner but must understand that beats will happen and some of them will be large (if it is a bad beat). Assuming that you let go or cut poor hands short, these larger losses can be avoided consistently. In poker and in life: scared money is dead money! The same principal holds true in investing and in life. The people that assume the risk and calculate the odds of success are typically the ones that come out ahead with larger bank accounts. They don’t focus on the losing aspect of a deal and never blurt out the words “what-if”. To repeat, they don’t ignore possible failures as they prepare for the worst and expect the best. I will not deny that I have been in situations where I was scared to lose but that helped me seek out the answers to consistent winning. Losing will always sting but I now accept losing as part of the game. I expect to win each trade but ultimately understand that some will fail and it’s ok as long as I don’t let it become catastrophic. I have learned to accept losing trades, losing money and I have challenged the fear of money. I place risk under control by developing and using a positive expectancy system, position sizing and money management techniques that eliminate my fear of losing money. I may lose many small battles but I depend on my system to win the ultimate war. I am a trend-trader so my wins are large in a market similar to what we have just experienced. That quote can be tied to investing with great accuracy. I played well but I didn’t finish in first or in the money. 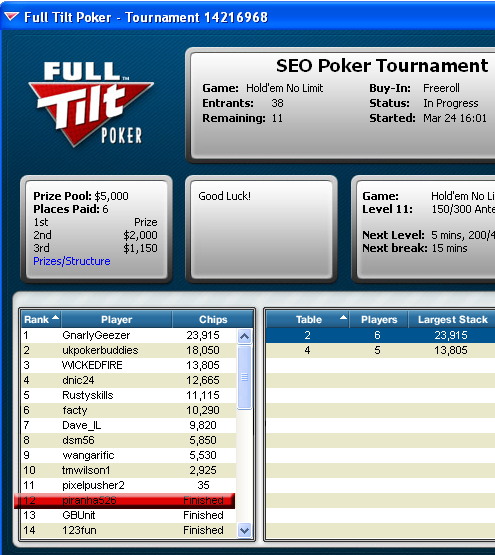 Aside from the top prize of high quality links worth up to $1,000,000, the next five positions paid a total of $5,000 which was offered by Full Tilt Poker. Only 38 bloggers (a little surprised) showed up to play in the tournament so my odds were high to finish “in the money” but I just couldn’t pull it out. I was trying to win and represent the stock bogging community but came up short. 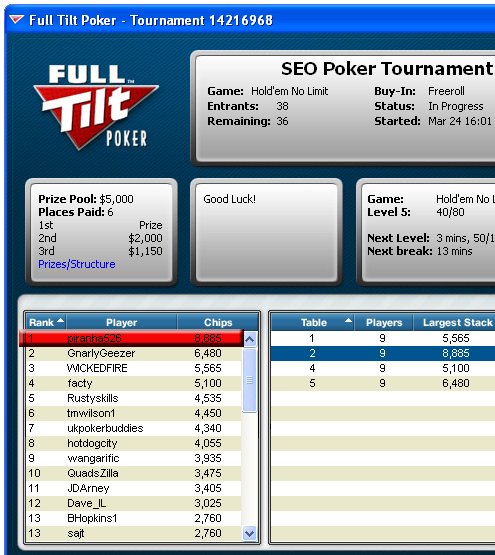 Here’s a list to all the participants of the 2nd SEO Poker Tournament. I was the chip leader early on as you can see in the screenshot above. We all started with a stack of 3,000 chips and I quickly placed an all-in bet against another blogger and won with a straight versus two pairs. He slow-played the two pairs and I completed my straight draw on the turn. I just called his bet after making my straight and then pushed all-in after the river, hoping he would call. He did and I was now the chip leader but it was early in the tournament as 94% of the players were still game. After a few rounds of play, some juggling of the players to different tables and a player break, I found myself in fourth place with 9,000 chips. The leader had about 14,000 chips at this time but I was still in excellent shape. I was first to bet with a pot near 1,000 chips and blinds at 150 & 300 (my stack was near 8,000 chips and my opponent was near 7,000 if I remember correctly). I bet out with 1,200 chips and he raised, to my surprise. I now thought he was bluffing or had the nuts with a 10-J. I was already pot committed so I got pissed and pushed all-in with my three 9’s and was called. A queen flipped on the river and he won with a straight and I was devastated late in the tournament with 1,100 chips and large blinds (relative to my new short stack). I should have never slow-played the flop and placed a large enough bet to make him fold his draw before the turn. Like trading, you must take what is yours and I didn’t and got caught the same way I caught a player earlier in the tournament. My thinking was to take a substantial win which translates into greed and I was taught a lesson. Greed is bad in poker and in trading. After the huge loss, I pushed all-in the next three hands and doubled my stack to 2,300 chips but was still in bug trouble as the leaders were now above 20,000 chips. On my final all-in, I had K-Q and I was called by someone with K-J (both hands were off-suit). I was dominating this hand and had great hopes of doubling-up once again but the flop came and a JACK was the middle card. My tournament ended with the flip of two more cards and I finished in 12th place. Half-way to the money (sixth place paid $450 in cash). Overall, it was fun but I felt I could have placed in the money and will once again look to learn from my slow-play of a hand that was mine prior to the turn. The problem is: I gave it away with a thought of greed! Congratulations to dnic24 of the PokerOwnageDOTcom Poker Forum for winning the grand prize.